Following hot on the heels of his Diamond Case (sold out! ), Club Case (still some left over here), Juno recently presented his Heart Case… anyone guess what the next one’s likely to be?! 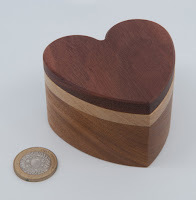 Heart Case looks like it could be handy as a small jewellery box – and indeed Yukari has had a little fun with exactly that idea in one of her blog posts. There are three clear layers to the box and the bottom seems to have an inset, err, bottom, which appears to be floating in some respects, but very firmly attached in all important aspects. At this point a neophyte might well be tempted to declare victory, close it all up again and move onto the next puzzle… but you can’t fail to notice that there is a lot of space unused to date, which would be unusual for one of Juno’s puzzles… so press on and discover a beautifully elegant way to unlock the final, massive space right where you thought it would be all along. Juno classes this as a reasonably simple puzzle, but it is delightful, and could certainly be used to coax newbies into doing a little puzzling as nothing is ever too challenging and there’s always something that can be explored, with hints popping up along the way on how to progress. Can a Spade Case be far off? Louis’ been at it again… well, it’s his own fault really – from the first time he put a year after the name TrickLock, everyone has assumed that there’ll be one every year, right? Louis has delivered again in 2018… just in time to have the final design tested and declared fit for IPP38 – good timing, that man! Right, what have we this year? 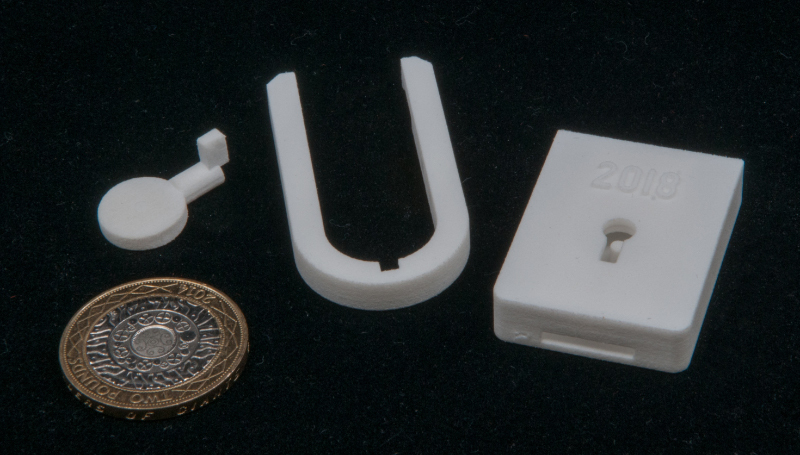 A familiar little form factor, clearly in the shape of a little white padlock. 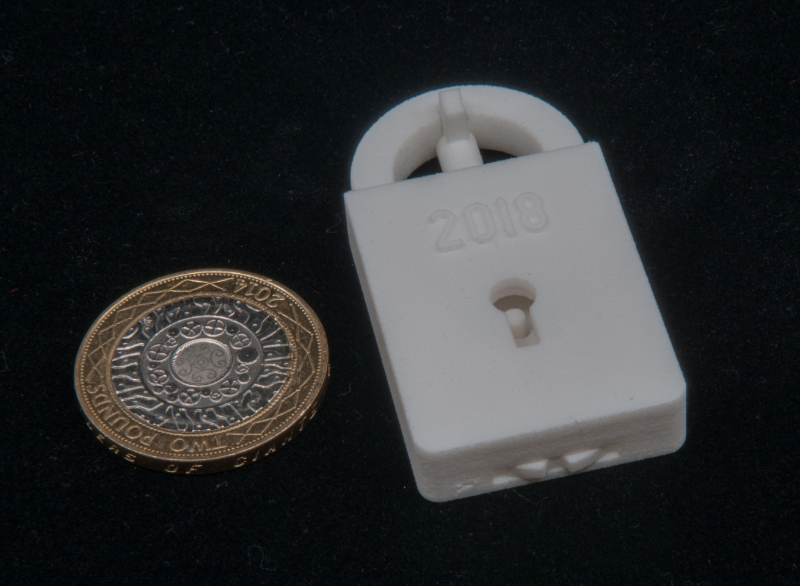 As has become customary, the year is embossed on one side and there appears to be a key trapped in the hasp – trust it’ll be useful at some point, but for now it’s not going anywhere. There’s a pretty standard looking keyhole and an odd protruding thingamy at the bottom – no doubt that will get interesting too. A little exploration releases the key fairly early on, but it doesn’t seem to be quite as useful as you might prefer – this is after all a TrickLock. From there on, there are three or four very distinct stages, each of which needs a different approach, even though you seem to be reusing some of the same elements along the way – it seems that whenever you think you’re finally there, Louis has hidden another little trap for you to negotiate. I’m pretty much always amazed by just how much puzzling Louis manages to cram into his little TrickLocks – this one is no exception. If you liked any of the others, you’re bound to love this one. 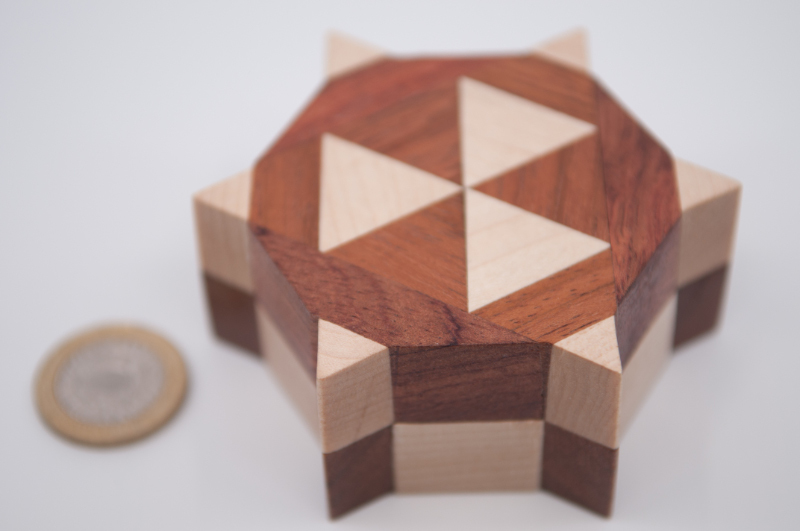 Unless this is the first post you’ve ever read on my blog, you know I’m probably going to say nice things about this puzzle… Spoiler alert: it’s my blog and I choose not to write about puzzles that I don’t like – simples! So let’s get that bit over and done with: this is a neat little box that surprises(!) throughout its solution – there may only be four moves(!) to solve this puzzle, but they are all interesting and unexpected in their own way… it’s clever. For a while now Rob has been randomly selecting names from his ever-growing mailing list to offer his new batches of puzzles to… that’s become a mounting headache and generally results in piles of emails from people who weren’t on the list this time. With the release of no.33, Rob’s headed in a different direction and added a shop to his website, and let market forces / collectors’ eagerness take care of the rationing for him. Fast forward a couple of weeks and I have a lovely little puzzle in my hands and I find I cannot get it to do anything interesting… Rob tries to help by suggesting it might have jammed up a bit on the trip across the ocean – Yeah, right! I tell him it’s almost certainly down to operator error. It took me several days to stumble upon the first move… it worked exactly as it should – it certainly wasn’t jammed, I just didn’t try the right thing… the first move is interesting… definitely not what I’d anticipated! Eric Fuller’s latest batch of puzzling goodness contained a really eye-catching little number called X-Cage. 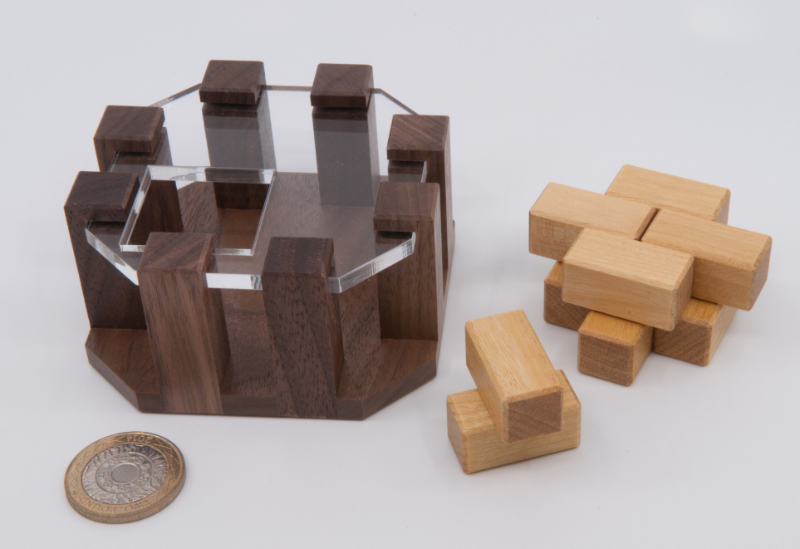 This one comes from the fertile imagination of Frederic Boucher, the designer who brought us some other recent Fuller-creations like Artefacts and Marble Cake Plus – Boucher-san knows his packing puzzles! 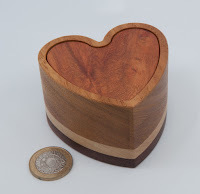 This one gives you a set of 5 Yellowheart cross-shaped pieces and a Walnut frame with a captured acrylic plate serving as a lid. There’s a handy square hole cut in the acrylic, big enough to allow a single piece to be inserted into the frame… clearly the intention is to place all five Yellowheart pieces into the frame. Sit back, smile, tip of the hat to Boucher-san, and then Think(c). Think and experiment. Quite a lot. And then apply the old Holmesian logic of whatever remains after eliminating the alternatives must be the solution, no matter how strange it might appear… and if I’m honest, I went through a good few of those before I eventually struck puzzling gold – and a fat grin spreads across my ugly mug and I mutter something under my breath about the designer – he’s good, really good. 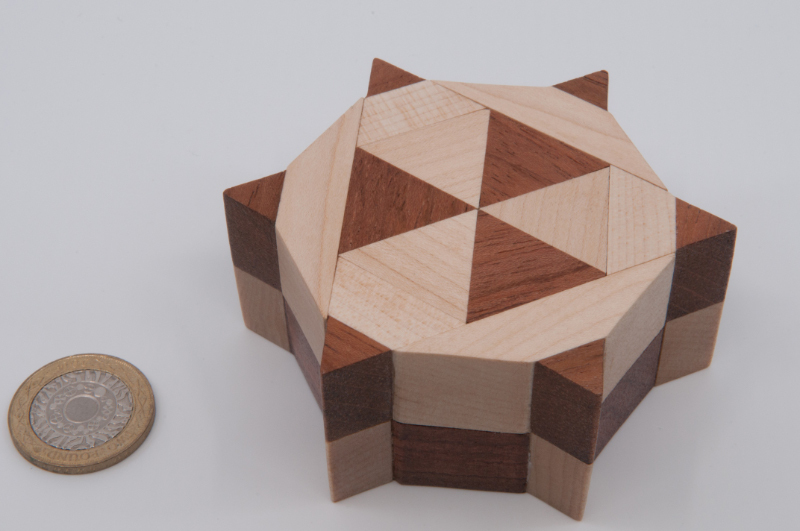 This is a great puzzler’s puzzle – definitely one to taunt other puzzlers with.